Ascocenda Vernon Kebodeaux is a bigeneric orchid hybrid resulting from the crossing of Ascocenda Tubtim Velvet with Vanda Charles Goodfellow. Pictured below is one that has a yellowish colour with a chartreuse section visible made by crossing the pod parent with V. Charles Goodfellow 'Yellow'. The colour for Ascocenda Vernon Kebodeaux ranges from having off-white background with pink polka dots, pinkish-yellow-green background with pink spots, clear yellow-green background to white background with no spots; these background variations are usually marked with a chartreuse inner lateral sepal section (see here - JGL Agricultural). 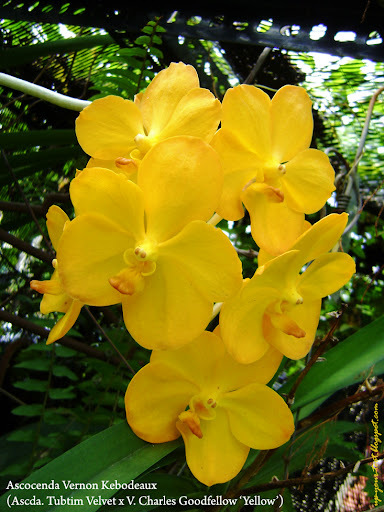 If you take a look at the last page of the Saint Augustine Orchid Society newsletter (Vol. 3 Issue 3) you will see a similarly yellow coloured Ascda. Vernon Kebodeaux (flowering from 3 nodes at the same time!) and a pink polka dot version from their website (photo 62-13). It is interesting to note that the family name of the person that this orchid is named after is a strange one, of Spanish origin, Quevedo, then 'frenchified' by the Southerners to Quebedeaux, and then changed to Kebodeaux. Ascocenda Vernon Kebodeaux - this photo was taken in 2009, in my very 'jungle-like' orchid shed growing under neglect for about two years (and it still flowers regularly!). As a tropical orchid, this plant thrives in humid and warm conditions and is a prolific bloomer for a medium sized Ascocenda. For me, this plant does better under 60% light in moist humid condition (40% shade - leaves grow long and turn a dark green as it was growing in an orchid shade overgrown with giant sword ferns and covered with weeds from all sides!). The plant would produce inflorescence with big flowers from every node even though it was not fertilised for almost 2 years in my old place. When I moved to a high rise dwelling, this plant had smaller flowers despite more frequent fertilisation (every other week). Furthermore, the leaves are shorted under high light exposure (due to both the light and also the drier conditions) and looked rather stunted. It however, still does flower from every internode! So if you want a relatively easy Ascocenda that can stand neglect and still make good of its presence, this is the one to get. Ascda. Vernon Kebodeaux on 19 Nov 2011, on a sunny and breezy balcony. The parents for Ascda. Vernon Kebodeaux are two quite 'well-known' orchids by their own right. Both Vanda Charles Goodfellow and Ascocenda Tubtim Velvet have many award winning clones. Vanda Charles Goodfellow is quite variable, and some of the plants can have speckled petals, whilst others a plain. Some clones of V. Charles Goodfellow have very rounded (the petals and sepals appear to make a complete circle) but somewhat cupped feature e.g. V. Charles Goodfellow 'Lakeland'. If you look carefully at the lateral sepals of V. Charles Goodfellow (especially in the plain yellow form) it has a faint chartreuse tessellated markings on the inner half, a trait inherited from its Vanda (first Vanda, then Euanthe, now Vanda again...geez!) sanderiana 'ancestors'. Ascocenda Tubtim Velvet too is a highly variable plant. 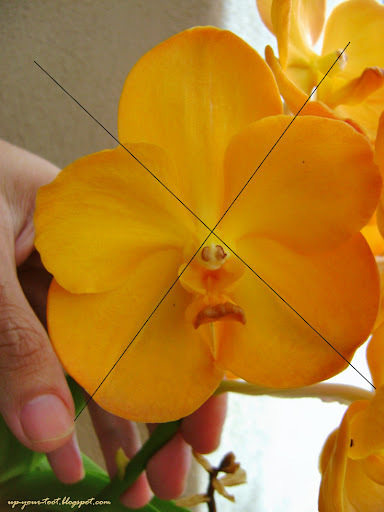 You can even get a tetraploid (4n) version of this orchid. Most of them have a strong chartreuse inner lateral colouration, and typically the rest of the flower is white with faint pink tinge and some pinkish spots here and there. The inner, lateral sepal coloration is sometimes called a quarter (like marked with a chartreuse quarter) as the area corresponds to approximately a quarter of the whole bloom. Usually, this area also have highly visible tessellated markings. This tessellation and the quarter colouration on the inner, lateral sepals are the doings of V. sanderiana. Flowers are typically complete and flat, which is a good trait, though some poor clones can have petals that are small. So the crossing of the two would give rise to multiple possible combinations. All are called Ascda. Vernon Kebodeaux (the rules of orchid crossing and naming - crosses with different forms/varieties are the same, reciprocal crosses are considered the same, selfed seedlings are also treated the same). Ascda. Vernon Kebodeaux was registered with the Royal Horticultural Society (RHS) International Orchid Register on 26 August, 1997 by R.F.Orchids. A single bloom of Ascda. Vernon Kebodeaux showing the chartreuse coloured section that takes up about a quarter of the flower. If you look carefully, this quarter has stronger tessellated markings. Below is the listing of the parents for Ascda. Vernon Kebodeaux. Note that this is NOT a family tree; once the grex has been described to the base (primary hybrid), it will not be repeated again for the female and male parent (caution, the list might make you crossed eyed!). Ascda. Yip Sum Wah = V. Pukele x Ascocentrum curvifolium (s). The yellow coloured Vanda ancestors of this cross derive their coloration mostly from V. dearei and also once from V. denisoniana. V. Ellen Noa, as one of the parents, is a 'weird' lemon-green yellow coloured flower painted with V. sanderiana purple-red spots and tessellations. One of the hybrids produced from this is V. Eisenhower, which looks like a flatter version and better toned version of V. Ellen Noa. It goes to show that the lemon yellow colour of V. dearei is very dominant (or at least co-dominantly displayed) in a cross. 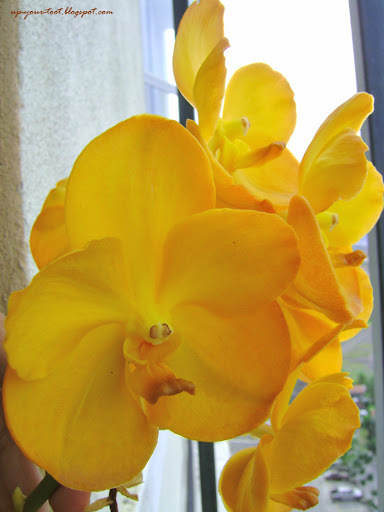 Very cheerful colour that for sure brighten up your balcony. Oh yes. This is one out of 3 orchids that I kept when I moved to my current place.